Edouard Manet (1832 – 1883) and Wayne Thiebaud (b. 1920) aren’t two artists I normally associate with one another, but the two pieces here, while very unlike in effect, are so similar in pose and detail that I have to wonder if the one is a cheeky quotation of the other. The Manet is a depiction of a dead bullfighter, not on the sun-baked, kicked-about sand of a bullring but in romantic isolation and smoothness and stillness–a spiritual condition rather than a physical space. He might be napping were it not for that decorous little trickle of blood. 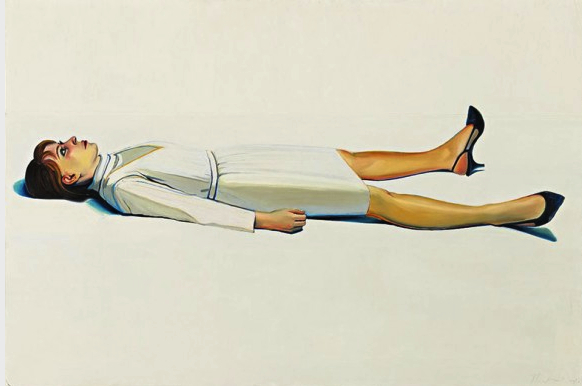 Thiebaud’s supine woman is presented no more realistically than Manet’s matador, but to very different effect. Instead of his evocative, decaying light she floats in her bright, juicy, abstract white field. The pictorial action is in the contrast of the improbably powerful blacks and flesh tones, the utterly arbitrary and audacious blue shadows–and her expression. She couldn’t be more alive: she is spirited rather than spiritual, a very sentient model who looks as if she has other and better things to do than lie there for one more minute. There is smoothness of a pop sort, but no romantic isolation or stillness about her. She is Manet’s toreador reversed in every element.